Currently, footwear industry uses large quantities of diverse raw materials in order to meet the requirements specified for each part of the final product. Among these materials, a large percentage are textiles and most of them polyester. Polyester fibre is one of the most versatile and important synthetic fibres since it provides properties highly valued by the customer such as shape retaining, crease-resistance and softness-to-the-touch. 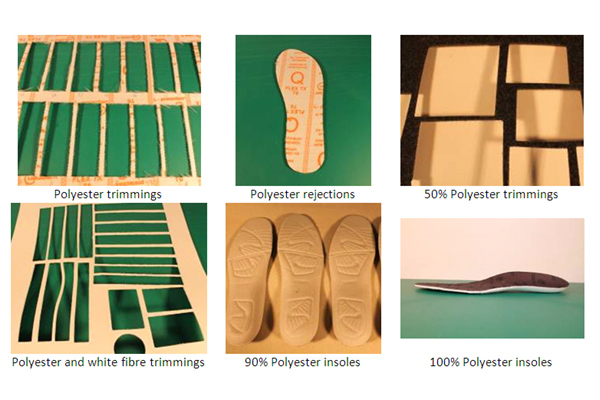 These and other characteristics have lead to an increasing consumption of polyester fibre in the footwear sector. The successful and increasing introduction of polyester in the footwear manufacturing is directly related to the waste generation derived from these activities. Polyester wastes are mostly composed of trimmings and rejections from each part of the final product, which contain polyester either in isolated form or mixed with other materials. Currently, there are only two end of life alternatives for these type of wastes: (1) mechanical recycling to obtain low added value products and (2) landfilling, being the last one the most employed. Within this framework, the LIFE-ECOTEX Project is born to meet the guidelines set by the LIFE Program-Implementing Circular Economy.